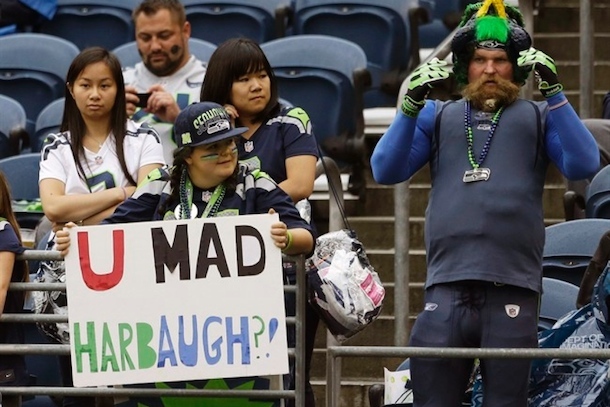 The Seattle Seahawks and San Francisco 49ers have had a pretty intense rivalry going for the last two seasons. Both teams have young, mobile quarterbacks. Both have rabid fans. Both are in the NFC West. However, now that they’ll be squaring off in the playoffs for the first time ever, the rivalry is really getting hot—especially where the fans are concerned. Earlier this week, for example, we told you about one Seattle fan’s biased comparison of Russell Wilson and Colin Kaepernick, then we told you about one San Francisco fan’s response. Now we’ve got a pretty epic prank played by Seattle radio station MOViN925 on one unsuspecting 49ers fan. What did they do? They found a Niners fan with tickets to this weekend’s game in Seattle, called her pretending to be somebody from the Seahawks ticketing department, and told her they were canceling her tickets. Could this be fake? Absolutely. But it could be real, and either way it’s a pretty good segment.